Happy Monday!! I maybe got 3 hours of sleep last night thanks to the lovely Piper and Jack. If I drank coffee, I’d most likely be on my 10th cup already. I have so much to do today, and was planning on getting in a leg workout during nap time, but...well we’ll just see about that. I wanted to share last weeks workouts, and start doing it regularly from now on. I log in all of my workouts HERE (I started from when I was 14 weeks pregnant), but I think it's nice to sometimes see specifics and get ideas from how other people workout. I worked out at home, during nap time, with a set of dumbbells, a kettlebell, and booty bands. It felt like such a good workout, and left me with the ole' noodle legs. Jordan has the kids for a couple of hours, so I headed to the gym and was planning on getting in a long, sweaty workout. A power yoga class was just starting when I got there, so I decided to do that instead since I figured it would be good to help my body deal with stress. Today was a rest day! I went on a long walk with the kids, but Piper was pushing her stroller - so it may have been long, but we didn't get too far. Jordan had the kids again for a couple of hours, so I headed to the gym and actually did get in a long workout this time. For the sprints, I run as fast as I can. They were killer, but felt so good. I did this full body workout at home, during nap time again. I don't like doing HIIT workouts back-to-back, because it doesn't allow your body to properly reap the benefits and adapt, but since yesterday's HIIT wasn't very long, I didn't feel like I was pushing it. Again I used a set of dumbbells, a kettlebell, and booty bands, and it was a good workout! I did this workout at home at night, once I got the kids down to bed. I wasn't feeling it, and tried talking myself out of working out 100x, but I got changed, turned on Gilmore Girls, and got down to business. The hardest step is always just getting started. Once I begin, it's just a matter of going through the motions. Plus, Gilmore Girls is a great distraction. I started teaching spin classes a few years ago, taught throughout both pregnancies, and can't wait to start teaching again soon! 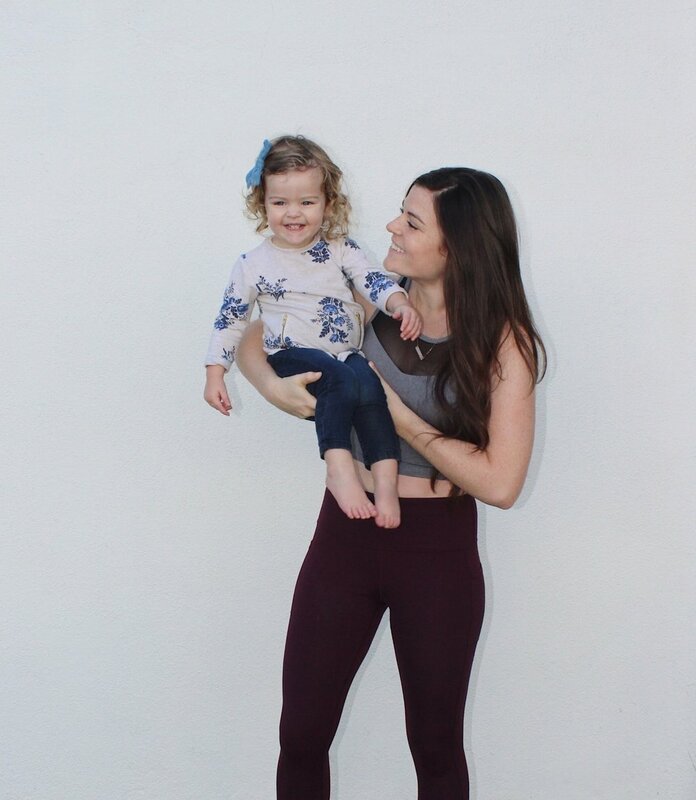 It's my favourite form of cardio, and it's actually great during pregnancy too because it's easy on the joints (which loosen during pregnancy), safe for the pelvic floor, gets your heart rate up, and also strengthens your muscles while doing it! It's a little hard to share spin workouts via social media, so I hope this workout below makes sense and is easy to follow. For intensity, think of it between 1 and 10. 1 is little to no intensity, and 10 is so much that you wouldn't be able to keep doing it for longer than 30 seconds. I have provided a guideline of what intensity you should be at for each section. Enjoy! **While I am a certified trainer and instructor, I can't watch you while you workout, and you are in charge of your safety, and making sure you don't push yourself too hard. Be sure to probably stretch afterwards, too! Happy Tuesday!! I tried uploading this video to youtube yesterday morning, but it seriously took until 10:00pm last night for it to finish uploading #nottechsavvy. I filmed my entire full body HIIT workout at the gym last week, and edited it so it's easy to follow along! Although I did it at the gym, it's def not required. The only equipment I used was a kettlebell, dumbbell, and a stepper. If you don't have any equipment, I'd recommend using milk jugs, soup cans, etc. in place of the weight - get creative! If worst comes to comes, you can still do the moves without any equipment! As for the stepper, a chair or a coffee table will work great! Let me know if you give it a crack!